Outdoor cooking differs substantially from kitchen-based cooking, the most obvious difference being a lack of an easily defined kitchen area. As a result, campers and backpackers have developed a significant body of techniques and specialized equipment for preparing food in outdoor environments. The type of food common in outdoor settings is somewhat different compared to household foods, and also differs depending on the type of cooking activity. While someone at a public campground may have easy access to a grocery store and be able to prepare plenty of recipes with fresh meat and vegetables, someone on an extended trip into the backcountry will not be able to carry large amounts of fresh food, due to the extra weight from a high water content, and will have to rely heavily on food with a low water content, such dried meats and vegetables, packaged dehydrated camping foods, and starches such as ramen, polenta, and dried potato flakes. Wilderness experts in both categories sometimes make use of locally available wild foods as well, particularly wild vegetables and fruit, but also the occasional fresh fish and wild game. It is not unusual, however, for camping food, especially backcountry food, to be partially or totally vegetarian. 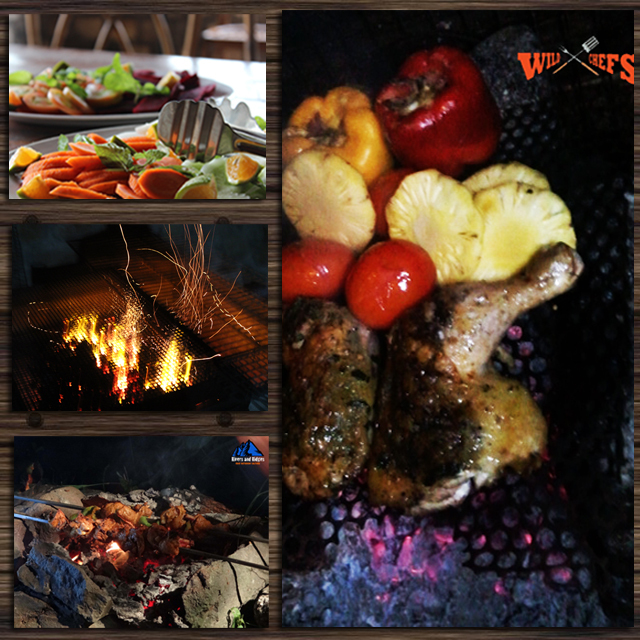 We have been inspired by many rural ways of cooking and we bring those out to you in their most authentic form. The earthy taste of the food is a memorable one and its hard to produce similar results when you try to cook it over the gas stove, therefore the only chance you can get is by putting some effort into it. That is, some hardships to find firewood collect some stones to arrange the pit, use primitive or modern techniques to light the fire, get some smoke into your eyes while you cook as well as control the fire so that your food doesn’t burn. Finally you sit down on the ground or on a log to enjoy your meal cooked with 100% dedication.